Jaaman Tanteidan: Matonarikumi (じゃあまん探偵団 魔隣組 秘ジゴマ捜査ファイル, Jāman Tanteidan: Matonarikumi Hi Jigoma Sousa File?, lit. Jaaman Detective Club Demon Neighborhood: Secret Jigoma File Search) is an adventure game developed and published by Bandai for the Famicom Disk System. 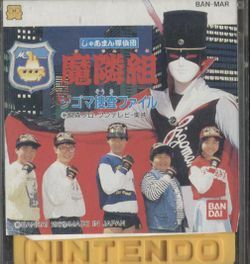 The game uses the license of a TV show that was also the basis of Bandai's earlier action game Omoikkiri Tanteidan Haado Gumi: Matenrou no Chousenjou. Both games feature teams of schoolchildren detectives as they hunt down an elusive thief in a mask and cape. The game follows a sub-genre of Japanese adventure games that include a top-down RPG style world map to walk around on, rather than simply selecting destinations from a menu. Otherwise the game is similar to other Famicom Portopia/Tantei Club-derived detective adventure games; the player must search for clues, talk to witnesses and suspects and solve inventory-based puzzles in order to proceed. This page was last edited on 14 March 2015, at 17:45.